Hello Fellow Travelers, what’s up? The whole of last week I spoke at length about how armchair travel was totally not my thing, after an epic fail of a trial at it. ugh. Starting today, you’re getting a peak into our travel albums, and memory stores, and I for one, absolutely cannot wait. So let’s get started! This picture was taken in the winter of 2012 during my Luknow trip. Cloudy skies, lazy mornings, and a manual water pump in the middle of our house. That was as amazing as it gets. This house is an old-ish two level bungalow sort of a thing, where we occupy only the ground level, and the terraces on the first level. All the rooms on the first level are locked out, and I swear to God, they smell of undiscovered traveler treasures. Seriously. I’m a big sucker for old things, be it a piece of parchment, an old letter, an old quill, ink pot, fabric, a crochet heirloom.. I’m a bit of a collector, though my collection has very very little to it. 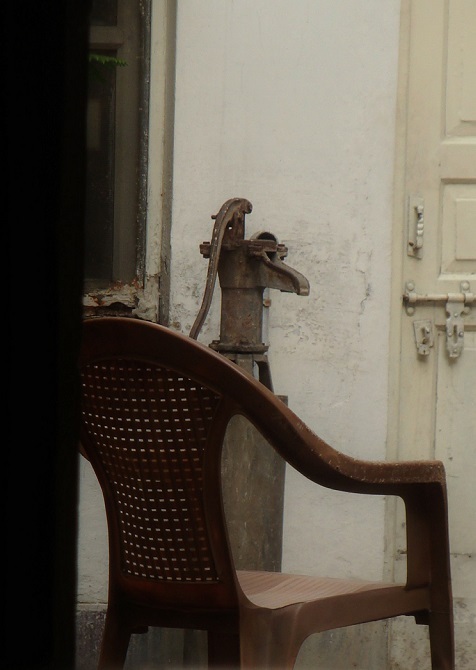 Every day in Lucknow we’d experience diversity, progress, novelty, and come home to this old hand pump, that has just always been there. Rumor has it, this used be a village ground which was later taken into redevelopment. How the pump remains, I have no idea. But to me, it stands for the interaction of our history with the present.. which would be the plastic chair right by it. I like the whole rustic look it brings with itself.. just standing still as everything moves around it at a maddening pace. And I’m gonna go now!